Attention deficit disorder (ADD) has long been affected by many factors. For parents treating children with ADD in particular, medications and other treatments can work to their best if attention is given to lifestyle factors. One such factor is sleep. The opposite is also true in that ADD that is well treated can support a better night's rest. What is interesting about the relationship between ADD and sleep is that kids who are diagnosed with ADD and sleep disorders can show similar symptoms. These symptoms include lack of attention, hyperactivity and restlessness. While many adults who are sleep deprived may “shut down” in that they become drowsy and tired, children can go the other way by becoming more excitable and restless. Why do ADD Kids Experience Sleep Issues? There are many reasons that a child with ADD may suffer from sleep problems. Some may be related directly to the ADD itself while others are shared with children who don’t experience ADD symptoms. This means that some of the sleep difficulties suffered by those with ADD are unique to their ADD. For others, they could be suffering from another disorder such as anxiety that isn’t related to their ADD, which is causing their sleep disorder. The medications used to treat ADD are of a stimulatory nature and these may cause sleep problems as a side effect if taken at night, for instance. Yet conversely, not treating ADD with medication where needed can similarly disrupt sleep. In yet other instances, the sleep disorder bears no relation at all to the ADD and may be suffered by anyone. A child who suffers from ADD can be more inclined to suffer from restless leg syndrome. Here, they move their limbs periodically due to uncomfortable feelings on their skin. The disorder is usually worse at night and involves a strong, compelling urge to move their legs. All of this movement at night can leave sufferers feeling unwell the following day. One study showed that those who have restless leg syndrome and ADD will show more hyperactive behaviour the following day. Children who suffer from snoring or a disorder called sleep apnea – involving disrupted breathing – can experience a worsening of ADD symptoms. In one interesting study, researchers found that children who have ADD are more likely to be snorers compared to children without ADD. 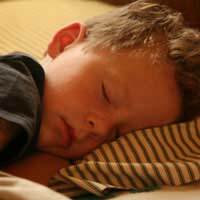 Experts still disagree on the prevalence of sleep disorders in children who suffer from ADD. Some studies suggest that sleep disorders are far more common in ADD children. Other studies, however, are inconclusive, which suggests that we need more data to understand the relationship. What we do know is that if a child who has ADD is not appropriately treated – particularly with medication where needed – the quality of sleep is affected and sleep disruptions are more common. In turn, ADD symptoms the next day can be worsened. We know that ADD can have a major negative impact on a child’s cognitive abilities as well as their ability to form good social links and relationships. If left untreated, scores on IQ tests can be lower and many other problems may result in their development. The effect of sleep on ADD requires much more research. We do, however, have enough data to show that sleep is especially important for children who suffer from ADD. Parents need to monitor their child’s symptoms and seek help for any sleep issues. The best approach is to ensure your child is receiving effective treatment for ADD. There are some simple measures you can take at home to help your ADD child obtain a better sleep. Try to maintain a consistent bedtime schedule and morning schedule. Include quieter activities in the evening such as reading a book together. Also pay attention to diet by offering your child healthy bedtime snacks that aren’t high in sugar. Music can be a helpful tool to relax your child and help them to unwind before bed and also to fall asleep once in bed. It is important to treat children with ADD and sleep disorders, particularly as it is estimated that a quarter of ADD sufferers will also be faced with a sleep disorder at some time. Sleep problems coupled with ADD can have a major effect on the entire family as well as how a child succeeds in school. In addition, they can cause other health problems as a result. It is important to speak to a doctor if your child is suffering from sleep problems and has ADD. There are treatment approaches that are successful but the sooner you introduce them, the better for your child’s well-being. my 8 year old gets very little sleep. He doesn't seem to "wind down" , but will keep going until late in the night and often the wee small hours. I got him a portable DVD player and at least he now stays in his room - when he was younger it was a nightmare. I heard somewhere that some adhd children don't have enough of whatever hormone tells us we are tired and need to wind down. Does anyone else know anything about this?